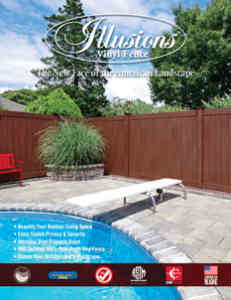 Illusions Vinyl Fence’s flagship product brochure. Featuring amazing photos of real product installs as well as codes and available accessories. 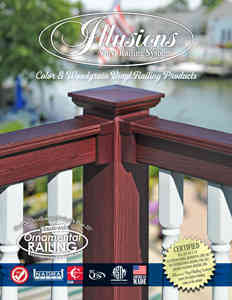 Make sure to check out the two terrific Grand Illusions Color and WoodBond fence spreads in the back. 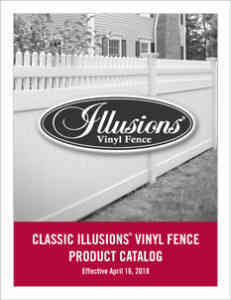 The Illusions Vinyl Fence Product Catalog features a comprehensive item by item, product code display of the Illusions Vinyl Fence styles available for order. PVC vinyl privacy fence, semi-privacy fence, Classic Victorian picket fence, contemporary picket fence, ornamental picket fence, curved and transition fence sections, post & rail, gates, arbors and pergolas, fence posts, bends, lattice, post caps, picket caps, gate hardware, and fence accessories. Illusions Vinyl Fence is perfect for commercial and industrial fencing applications. This brochure is full of specs, certifications, Miami-Dade Certified 75 MPH Wind Kit info, suggested commercial applications, and more. All shown with Illusions signature great photos. VMA Certified Illusions Vinyl Fence has many styles that are available for immediate shipment. This tri-fold brochure has images and codes for those styles. Illusions Vinyl Fence and Eastern Ornamental Aluminum Fence and Railing now have the added benefit of low voltage fence, deck, and railing lighting. This brochure shows available options. The Vinyl Manufacturers Association has completed the process to certify their members’ products to differentiate the quality of its members’ products in the market place. Being a part of the VMA adds value to the fabricators, distributors, and contractors that become licensed to sell certifies products by VMA members. 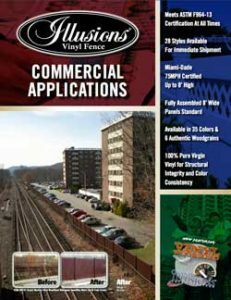 This is an informational brochure about the VMA and Illusions Vinyl Fence’s certification. This booklet features beautiful Grand Illusions Color Spectrum and Grand Illusions Vinyl WoodBond photographs and some of the stories behind them. A perfect added bonus to the Grand Illusions Tri-Fold brochures and the Illusions Main Brochure. Illusions Majestic 8″ x 8″ Posts are truly a grand thing to see. This is a tri-fold brochure showing some of the possible applications of using the posts as entrance-way accents. This brochure details the important uses of the Illusions “Extra Strong Hinge” for larger and heavier Uni-Weld Gates. Looking for a few quick reasons to make Illusions Vinyl Fence, the best PVC vinyl fence brand in the industry your next fence purchase? Download this little flyer. Want to know what all of the Illusions Fence social media search terms are? They’re right here as well. The Illusions Vinyl Railing System has many applications. Both residential and Commercial. 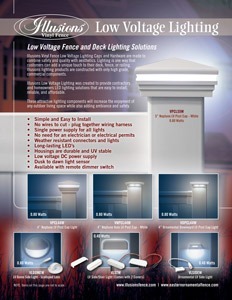 This brochure details the available styles as well as the certifications (ICC-ES AC174, IRC, IBC) necessary to install on residential homes and skyscrapers alike. There is also valuable information pertaining to the testing and advantages of the 100% Pure Virgin Vinyl used in the Illusions Vinyl product lines. Here is a link to the Illusions Vinyl Railing System PVC vinyl fence website where you can find all the information you need to know about the amazing 35 colors and 4 woodgrains of vinyl railing available through the Illusions brand. Illusions Vinyl Fence VMA Certification: The VMA (Vinyl Manufacturers Association) Certification is an incredibly important accolade to look for in any PVC vinyl fence brand. How is VMA adding value for the Vinyl Fence and Railing market? From the day that the vinyl extrusion company leaders led the founding of VMA in 2004, VMA has worked to strengthen and improve the state of the industry. The member companies have their plants and processes audited by approved third party testing labs. The Vinyl Manufacturers Association has completed the process to certify their members’ products to differentiate the quality of its members’ products in the market place. Being a part of the VMA adds value to the fabricators, distributors, and contractors that become licensed to sell certifies products by VMA members. FIND OUT MORE ABOUT ILLUSIONS VINYL FENCE VMA CERTIFICATION. Illusions Vinyl Fence Warranty: The best looking products in the industry give you a great warranty as well! 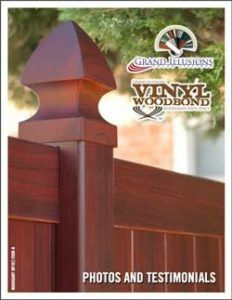 Classic Illusions Fence is protected by a comprehensive limited lifetime warranty, and Grand Illusions Color Spectrum and Grand Illusions Vinyl WoodBond products are protected by a twenty year pro-rated warranty. For details and warranty related questions, please visit the Illusions fence website at www.illusionsfence.com. 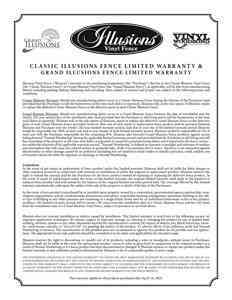 DOWNLOAD ILLUSIONS VINYL FENCE WARRANTY. What is ASTM F964-13 and how does it benefit me by purchasing an Illusions Vinyl Fence? 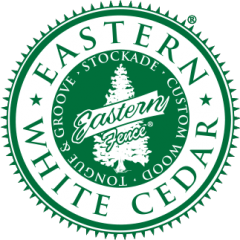 ASTM F964-13 is considered the “end all, beat all” testing specification for vinyl fence. 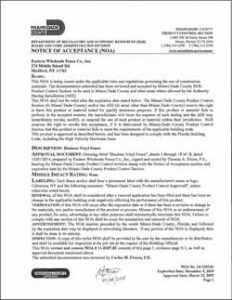 The purpose of this specification is to establish a recognized standard of quality for exterior vinyl profiles for use in assembling agricultural, commercial, and residential fencing and railing. This specification covers Illusions Vinyl Fence sections and the EverStrong Profiles used to fabricate them. To download product specification and CAD files for Illusions Vinyl and PVC Fence: Please visit the Illusions Vinyl Fence page at www.CADDetails.com. CADDetails.com is a comprehensive informational website built for architects, landscape architects, and companies that need to specify products. There are well over 100 styles of Illusions Vinyl Fence and Illusions Vinyl Railing System CAD and PDF files for you to download. There are also specification files created to be used on projects and installs where you need to have this exact information available. You will have to fill in a simple application to become a member of CAD Details to have access to all of the great fies. It’s free, it’s very comprehensive, and they don’t spam. If you’re doing commercial fencing or architectural fencing projects, specifying Illusions Vinyl Fencing is one of the first and easiest things you can do. 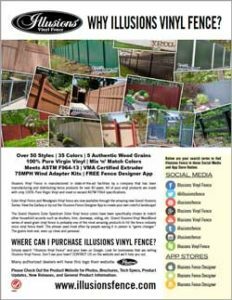 If you’re looking to do a DIY do-it-yourself installation of Illusions Vinyl Fence, here is a copy of the Illusions Vinyl Fence Installations Instructions. Step by step fence installation instructions guide you through line, end, and corner fence post selections, Illusions styles of fence selection and metal U-Channel correct railing placement. Installation planning, post hole digging and size, setting and installing of posts and panels, and Illusions material specifications and quality assurance. Whether your a licensed Illusions Vinyl Fence installer, or a DIY consumer looking to install Illusions PVC Vinyl Fence Gates, these instructions will help. 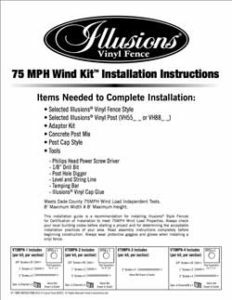 Detailed instructions for installing the Illusions 75MPH Wind Adaptor Kit. An NOA is often required for Illusions Vinyl Fence 75 MPH Wind Kit installations.